3. Breeding ferrets can be difficult, especially if you are not experienced. Not all ferrets make good parents, and it is common for a breeder to remove the babies to protect them. 4. One of the top fun ferret facts is that you can litter train your ferret with a little patience. If an accident does occur make sure that you use an odor remover. 5. There are many different ferret names used by owners and fans of this animal. They may be called Ferts, Fuzzies,Wuzzies, and many other names which reflect their curiosity and adorable appearance. 6. Many people assume that ferrets are rodents, but this is not true. 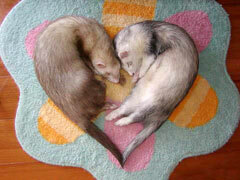 The long slinky appearance and the personality of ferrets are not rodent like in any way. 7. Fun ferret facts include the need for a lot of exercise and social time. Your pet should be able to play and run for at least four hours each day, and you will need to spend at least two of these hours interacting with your pet. 8. Ferret colors can be found in several varieties. Most of these animals are black and brown, but there are albino ferrets that are white or cream colored and occasionally you may also see one with a reddish hue. 9. One of the top ten ferret facts is the amount of trouble and danger your pet can get into. You will need to make your home ferret proof, covering electrical sockets and removing any dangerous items. 10. A ferret diet does not include fruits, vegetables, or high amounts of fiber. Instead your pet will need high protein and fat, with little fiber. This is different from most pet diets.